For the identically named station of the Guangzhou Metro, see Dongchong station. Tung Chung (Chinese: 東涌) is a station on the Tung Chung Line of the MTR rapid transport system in Hong Kong. As the western end of the Tung Chung Line, it is also a transfer point of those wishing to use the Ngong Ping Cable Car. As with all other MTR stations, Tung Chung has a unique colour scheme used throughout the station, in this case lavender. Tung Chung is only one of two stations on the Tung Chung Line not shared with another line, the other being Olympic. The contract to construct the station, valued at HK$1.1 billion, was awarded to Japanese construction company Aoki Corporation and commenced on 28 November 1994. The station opened with the rest of the new Tung Chung Line on 22 June 1998. Tung Chung station is located in the neighbourhood of the same name on the northern shore of Lantau Island, one of the inhabited locations on the island. The surrounding area is predominantly residential in nature, with the majority of buildings in the station's catchment area being residential towers and schools. Exit C of the Tung Chung Station opens up to a piazza which in turn connects the MTR Station to the Bus Terminus and the nearby Shopping Mall: Citygate Outlets. Both platforms share the same island platform underground. A "First Train" indicator is provided along the platform indicating to passengers which train to board. The Tung Chung station concourse is on ground level. There are 4 exits in total, and 2 are on each end of the concourse. An Urban (red) taxi stand is found outside Exit A. A Lantau (blue) taxi stand at Exit D provides taxi services to Lantau Island. Opened on 18 September 2006, the MTR-owned Ngong Ping Cable Car connects Tung Chung with Ngong Ping, where the Po Lin Monastery and Tian Tan Buddha are located. The Tung Chung Cable Car Terminal is about 200 metres away from Exit B of Tung Chung station. 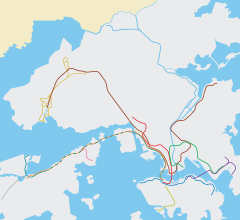 There is a large number amount of bus routes, located near the Ngong Ping Cable Car terminus and near the station, the route most criticized by local residents is the route *B6, as of late 2018 due to the opening of the Hong Kong-Zhuhai-Macao Bridge A lot of one day tours from Mainland China has rushed to Tung Chung and caused a huge nuisance to local residents. ^ "List of Current Contracts as at 31/12/96". Hong Kong Airport Core Programme. Hong Kong Government. Retrieved 13 April 2018. ^ "MTRC awards 'fast' contracts". South China Morning Post. 7 December 1994. p. 26. ^ Ng, Kang-chung (23 June 1998). "New line hiccups its way into service". South China Morning Post. p. 6. ^ a b c d e f g "Tung Chung Station street map" (PDF). MTR Corporation. Retrieved 5 March 2015. ^ "Tung Chung Station layout" (PDF). MTR Corporation. Retrieved 5 March 2015. Wikimedia Commons has media related to Tung Chung Station.